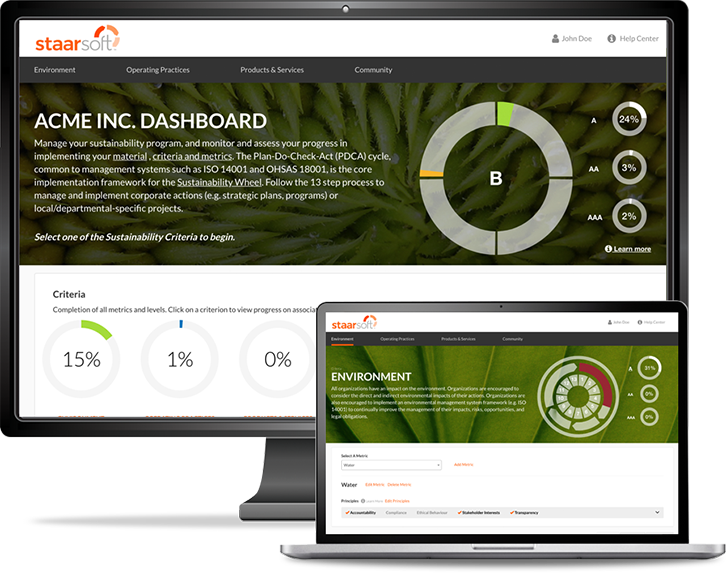 StaarsoftTM is sustainability planning and reporting software that provides organizations with the “how-to” guidance needed to plan, implement and manage a comprehensive sustainability program. A simple 13 step approach to sustainability management that addresses your organization's material issues. Step-by-step guidance to help you implement and continually improve your sustainability program. The ability to build on your existing processes by identifying gaps and actions to take your sustainability program to the next level. Built in self-assessment: a "snap shot" of sustainability integration that you can use to update your stakeholders. Interactive reports and data visualizations that allow you to track your progress at multiple levels. The ability to manage a project at a single location or your entire program at multiple sites. Software that can be used by organizations of any size, in any sector, at any stage of sustainability planning and implementation. The StaarsoftTM framework is founded in the Sustainability Toolkit approach to sustainability management, which has been tested with numerous organizations from various industries. The Toolkit helped us to get back on track with our sustainability goals. We now have a system in place where we can plan, track and monitor our sustainability metrics. Applying a systematic process such as the Toolkit is assisting GoodLife to realize a significant reduction in operational energy consumption, cost and GHG emissions. Overall, the Toolkit is a great way to take the initial step into sustainability for any business. I would recommend using the Sustainability Toolkit to any organization doing an internal review of their current policies and procedures. I would highly recommend the Toolkit to any organization interested in sustainability. The fact that the Toolkit tangibly structures action items within a cycle of goal-setting and decision-making makes it a practical tool to apply directly to our project management systems. The Sustainability Toolkit is helping keep things on track and avoid distraction, it is also allowing us to narrow down priorities with the confidence that we are continuing to remain in alignment with industry standards. Ready? Let’s build a sustainable future. TMSTAARSOFT and STAARSOFT Design and Trademarks owned by Tavares Group Consulting Inc.